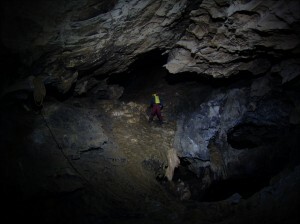 Plan today was for madPhil and Dave to take a bag of rope and rig all the down pitches to Consort Hall, the location of the main underground camp. At the same time, myself and Derek would bring the next diving bottle through the entrance series, picking up the original one on route and depositing them both at the top of Boulder Hall. As most of my caving equipment was already down at the entrance to Nacimiento, a very quick pack should have occurred, but a lot of faffing occurred trying to get the diving bottle into a comfortable position on my back. Lunch hastily prepared, something to look forward to today, a tin of sardines and a half chewed salami. Walk down to the cave not too bad today, borrowing a couple of walking poles to ease the pressure on my knee. No sign of the others on arrival at the entrance, so a quick change and we crossed the canal with the bottle and some small bags. Nearly a disaster when the metal ring on the tackle sack come off nearly sending the diving tank and me through Derek and back into the canal. Changed over to a better bag, picked up first aid kit and stove destined for the camp and set off. 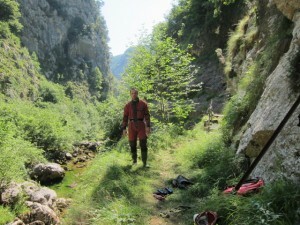 This time round lugging the diving bottle was considerably harder work. Each pull and push on the bag was accompanied by a grunt and an unrepeatable expletive. It was if the bag was nailed to the floor. Eventually we slowly made our way through the entrance series and up toward the start of the Ramp. Lunch was a sorry affair with the main excitement being when I opened the tin of mackeral and sprayed fishy tomato sauce all over my face. Spent the rest of the trip smelling of fish. The Ramp is a 100m 45 degree angle muddy slope. The intention was to pick up the original dive bottle here, but as luck would have it, it had gone. Hope was shortlived as it was at the top of the ramp now, having been moved by madPhil and Dave. Easy going to Boulder Hall, where we took the bottles up to the top of the chamber, and pulled them up a short climb into Brian Baru’s place. I had hoped to get them just slightly further to the top of the main pitch, but an awkward muddy climb was impossible for me to get up without some form of protection. Bottles deposited we started to make our way back down Boulder Hall, about half way down I spotted another slope heading off and had a quick poke up it. It lead to a series of interconnected chambers and passages, quite extensive with a lot of formations. I headed down a rather steep slope, around 10m, and dropped off the end. Looking back up it, and being on my own now, a slight moment of concern when I realised I might not be able to get back up. I was down anyway so I had a quick look round, no obvious way on and no draft, so I headed back to the climb. Derek appeared at the top of the climb and probably sat trying not to laugh, as I did my best Spiderman impression, trying to cram myself into one side of the climb and wiggle up the side of the climb. Eventually I reached the top and breathed a small sigh of relief, that could have been quite embarrassing and I had already eaten my emergency chocolate bar. We carried on back towards the entrance to finish off a little bit more of the depth readings for Derek and we exited the cave. Trip back up the hill was slow, with horseflies being the source of further swearing. By far the most evil of sciences creation, after Martin’s diving bottle. 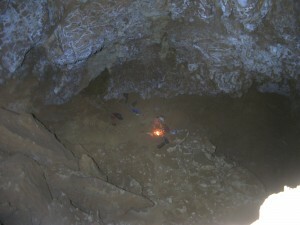 MadPhil and Dave returned back to the bunkhouse later, with news that cave rigged as far as Consort Hall now. A couple of pitches had to be re-rigged, as the rope had been mistakenly removed last year. 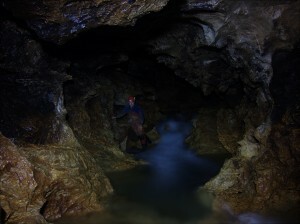 Good news was the sump part way through the cave had not filled again, and was at the same level as last year.